Data from Mars Science Laboratory's Radiation Assessment Detector (RAD) is enabling scientists to accurately assess the level of radiation exposure experienced during a mission to Mars. Understanding the risks faced by astronauts on future manned missions to Mars will help scientists mitigate those risks. But what exactly are the risks? Scientists have determined that the crew on a round-trip human mission to Mars would be exposed to 100 times the amount of radiation the average person experiences on an annual basis. The amount of radiation exposure faced by the crew could increase their risk of cancer by 5%, which is outside NASA's acceptable parameters. The risk increases if the astronauts land on Mars because they will not be shielded by the ship and Mars lacks a magnetic field like Earth's to shield people from radiation. 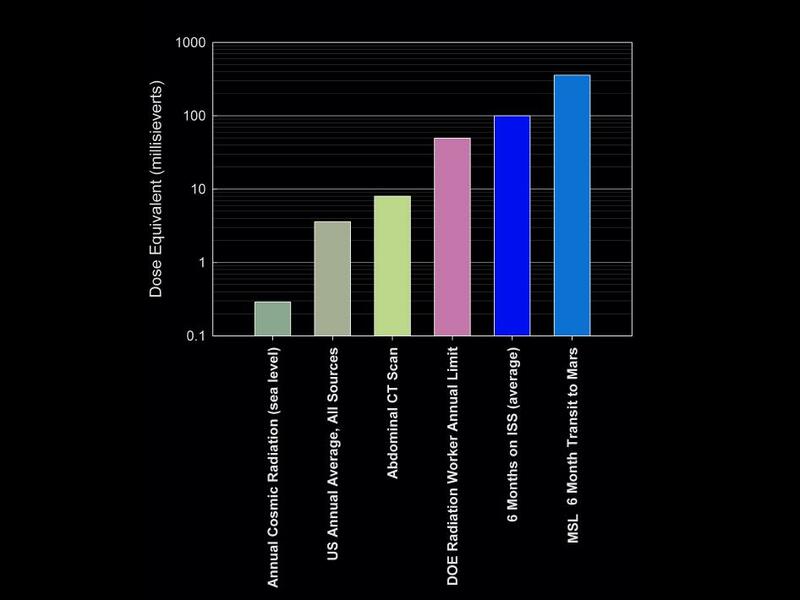 The below graphic from NASA compares the level of radiation exposure from several experiences, including a round-trip mission to Mars. While the level of radiation exposure is important to understand and mitigate, there is no reason why it should be a show-stopper for space missions. Just as a soldier signs up for the military knowing he could get shot at, an astronaut knows they could die from a spacecraft malfunction or radiation exposure, among other things. These risks, while not inconsequential, are acceptable, as long as before the mission the crew understands and accepts the risks. Not only that, but governments have no standing to prevent astronauts from embarking on potentially hazardous missions. There are numerous legal activities that increase a person's risk of cancer exponentially more than a trip to Mars. According to a study at Oxford, cigarette smoking causes a "25-fold increase in lung cancer risk in men smoking 25 cigarettes a day or more, compared to lifelong non-smokers," (Cancer Research UK) yet the government still allows people to smoke as many cigarettes as they want. Why then should astronauts be limited on how much risk they can take? If governments refuse to allow astronauts to take the risks inherent in their job, then it will be dependent on private corporations unhindered by unnecessary regulations to begin human exploration of the solar system in earnest.